1-DAY ONLY! 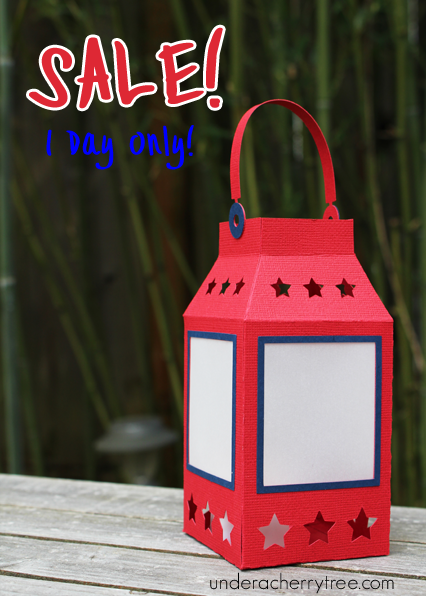 Sale on all LD Patriotic Cut Its (SVG) and graphics! Heads up! LD is running a 1-day sale on all their patriotic files including Cut Its, Graphics, Printables, and more. Don't forget to use a coupon to get an even better deal. The code supersummer will take 40% off your entire purchase of $15 or more. This sale is good for one day only and it will end on Tuesday night. Click HERE to grab the deals before they're gone. It's Frrrrriiiiiiday!!! 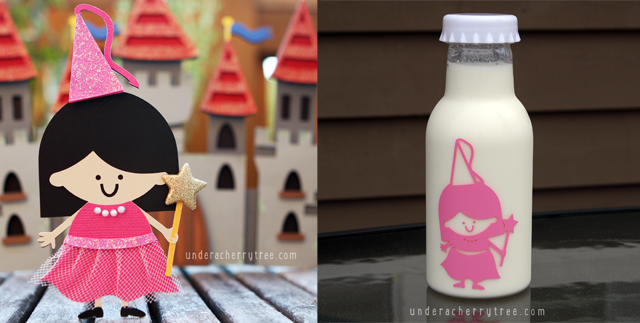 There's a new freebie and new art and cutting files on the LD site! The Holy Hodgepodge bundles are this week's new releases. There are 12 sets in each bundle and here is a sample of what the Holy Hodgepodge Cut Its bundle include. Click HERE to see what other images are included. Be warned that there are A LOT of files. The designs in the Holy Hodgepodge GRAPHICS bundle are in the .png format. They do not have cutting lines but are great for your digital projects. The Holy Hodgepodge Paper Pack comes with 12 sets of digital papers that coordinate with the Holy Hodgepodge Graphics and the Cut It bundles. Click HERE to see what is included. If you are buying any of the Holy Hodgepodge bundles, don't forget to use your coupon. The code SuperSummer takes 40% off any purchase of $15 or more on the LD site. The regular price of the Holy Hodgepodge Cut Its bundle is $60 but with the current sale and coupon, the price drops to $15! Great deal! Click HERE to get your Holy Hodgepodge. Click HERE or the image above to go to the LD site. Add DB Patriotic Words to your cart and checkout. You pay $0.00! The link to the download will show up after the "transaction" is completed. TIP: DB Patriotic Words is a dingbat. To use with your Silhouette Studio program, just install the file like you would a font. Use the TEXT tool to bring the image onto your virtual mat. scrapNfonts is a sister site of LD and they too have a freebie to give away. 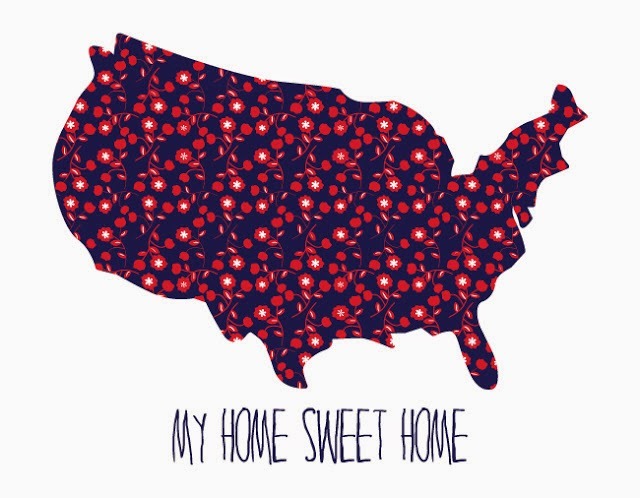 Click HERE to go to their Fontaholic blog and download the Home Sweet Home Patriotic Print (printable). Bundle 1 and 3 are both Cut Its. This means that they are cutting files. Several formats (SVG, DXF, GSD, EPS, AI) are included in the downloads and they can be used with the cutting softwares and cutting machines. The images in these 2 bundles already have cutting lines so you do not have to trace them with your cutting software(s). The images in Bundle 1 are Simple Shapes. There is only 1 layer in each of the images. 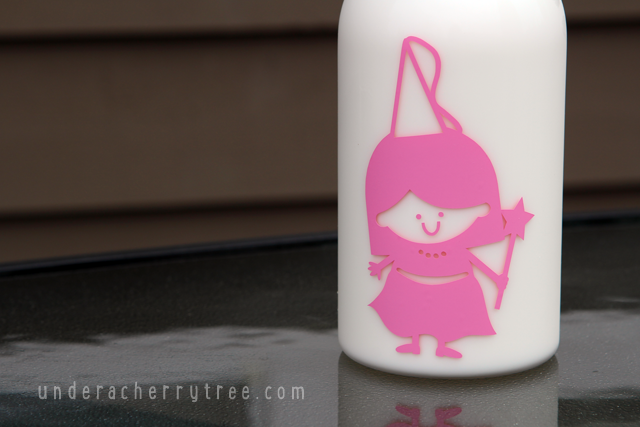 The Simple Shape Stringbean bundle would be great for vinyl decals or heat-transfer vinyl projects. On the other hand, the designs in the Bundle 3 come with multi-layers. These are what you would use for your paper-layering projects. The photo above shows the difference between the files in Bundle 1 and Bundle 3. The image on the left is from the Full-Color Stringbean Cut Its (bundle 3) while the vinyl decal on the right was cut out using the Simple Shape Stringbeans (Bundle 1). 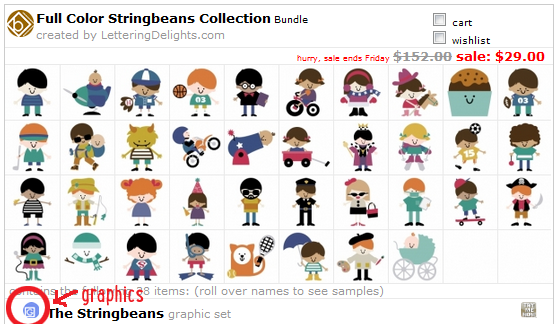 The other bundle that is on sale is the Full Color Stringbeans GRAPHICS. These do not have cutting lines and you must trace them in order to cut them out with your cutting machine. Get these if you intend to use them for your digital projects but if you are looking to use the Stringbeans with your cutting machines, I would recommend getting Bundle 1 or 3 instead. To learn more about the differences between a Cut It and a Graphic, click HERE. Use the code supersummer at checkout to save a whooping 40%! The final price of the Simple Shape bundle and the graphics is only $17.40 each while the Full-Color Stringbean Cut Its is only $21.60 after the coupon! That's an insane deal considering how many cuttings are included in each of the bundles! 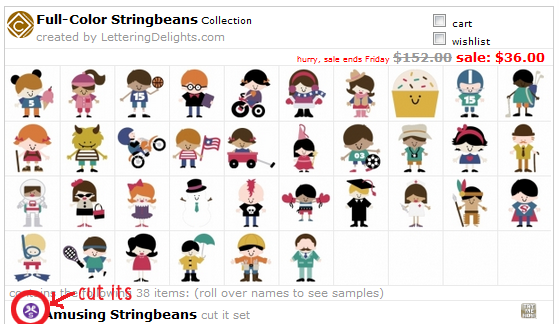 Don't miss out, get your Stringbeans before the offer expires! 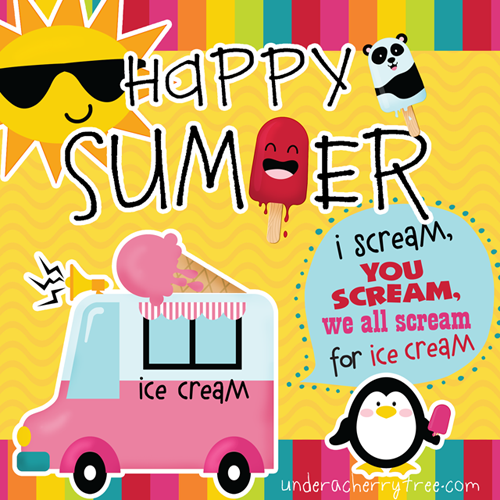 Click HERE to go to the scrapNfonts website to grab your free DB Summer Treats. Just add it to your cart and check out! You pay $0! The link to the download will show up after the "transaction" is completed. 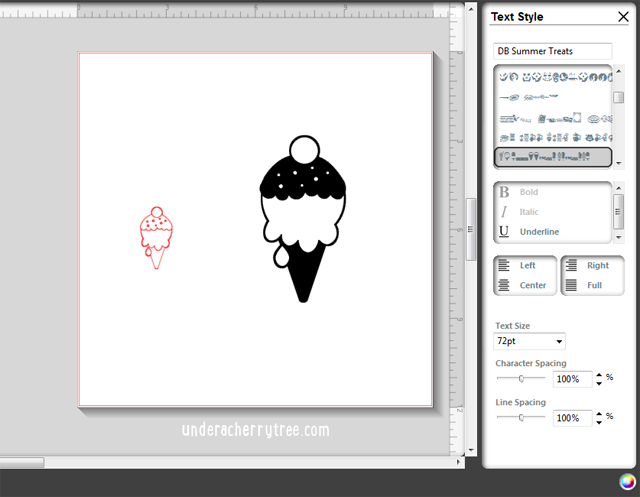 Note: DB Summer Treats is a dingbat. To use with Silhouette Studio, just install the .ttf file and use as you would with any fonts. As if the deals are not good enough, there is even a new coupon! Use the coupon code: SuperSummer to save 40% off your purchase when you spend $15 or more! Click HERE or the image above to go to the LD site. Add the Peepsicles Ice Cream Wraps (printable) to your cart and checkout. You pay $0.00! The link to the download will show up after the "transaction" is completed. p.s. At the time of this post, scrapNfonts has not posted a freebie. UPDATE: the scrapNfonts Friday Freebie has been posted HERE. 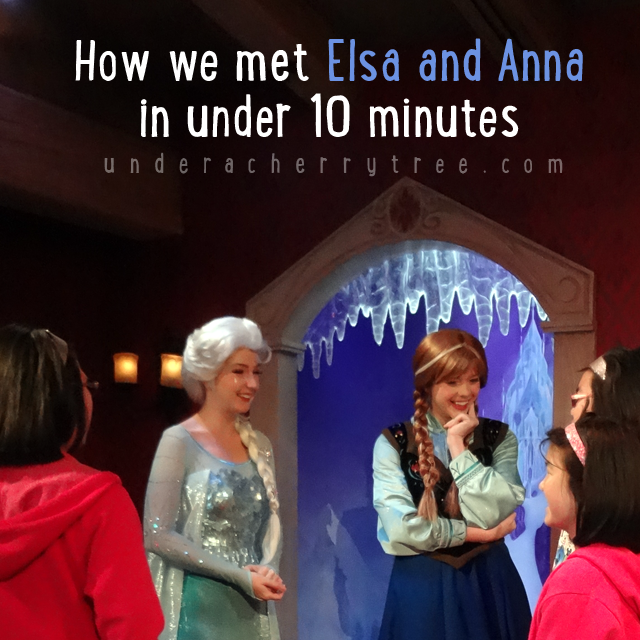 It has been three days since we met Elsa and Anna and I still can't believe that we did it in under 10 minutes! The whole thing happened so fast! 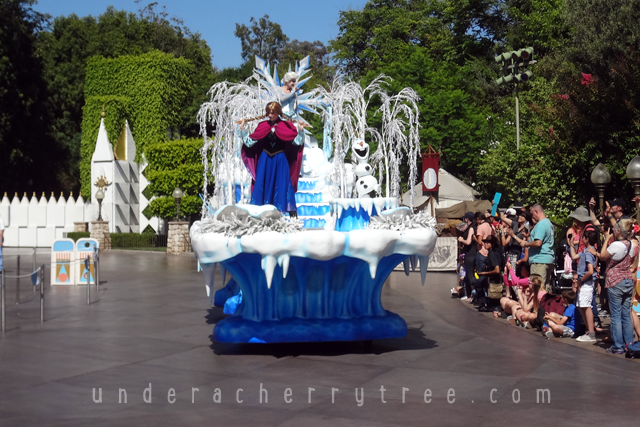 I am writing this post partly to record that Hubby actually did this, and partly for the folks who are headed to Disneyland this Summer to meet the Frozen princesses. I hope that today's article will help you to meet with them. Prior to meeting the Frozen princesses, we had read that the wait time to see them was very long. In fact, the day before we went to Disneyland, we met a woman with her young daughter in the hotel lobby. They were just returning to the hotel because the line to see the princesses was 3 hours long. It was 9:30am in the morning. Yikes! I told Hubby that there was no way I was going to wait that long to see a stranger in a fancy costume. I also told the kids that our Magic Morning was better spent on the rides that we enjoy. The girls sadly agreed. While Hubby and I were relieved that the girls did not protest, we also knew that our youngest child really wanted to see Elsa. So I stayed up to do some last minute research that night. I found and read the Disney forums and almost everyone mentioned that even though the park opens at 8 am, the meet-and-greet did not start until 10 am. They also said that there was no getting around the 2-hour wait time. One person mentioned waiting for 45 minutes but it was only because it was raining that day. On a whim I decided to check the Disneyland website. I found that the Frozen Princesses were at the house in between Pinocchio's Daring Journey and the Village Haus Restaurant. 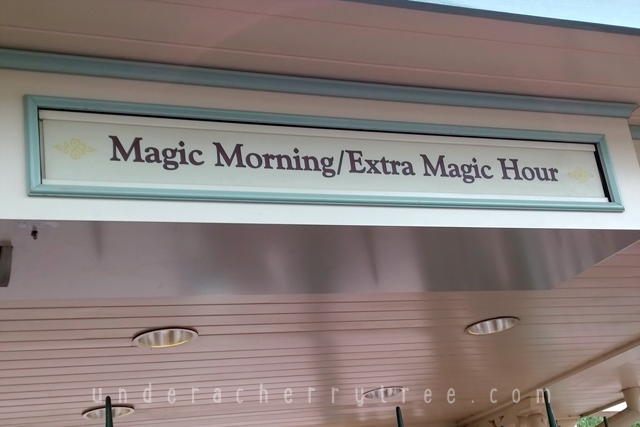 Even better, I found out that the Meet-and-Greet would happen at the park's opening or at 8am! I was so excited! If we stand in line as soon as we get into the park at 7am (Magic Morning's 1-hour early entrance), we may not need to wait longer than 1 hour to see the princesses! The trick was that we had to be as far ahead in line as possible. We agreed that Hubby would stand in line while I walk around the park with the girls. We will meet up when the Meet-and-Greet opens. ... the MEET-AND-GREET WOULD START IN 10 MINUTES!!! It was only 7am!! I ran to the meet-and-greet location with the kids as soon as I received Hubby's text. I was still panting when the doors to the Frozen house opened and we started snapping pictures of the kids with Elsa and Anna! We spent a few minutes chatting with the princesses and when we were done, we heard that the line at that point was already 90 minutes long! Wow. I cannot emphasize this enough. 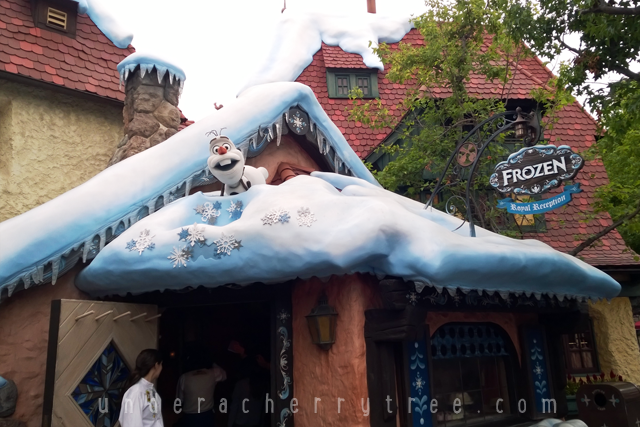 Find out exactly where the Frozen Meet-and-Greet location is. Disneyland is big and unless you go there very often, you may get lost looking for the Frozen house. Getting lost means losing time and that would result in standing even further back in the line. So don't get lost. 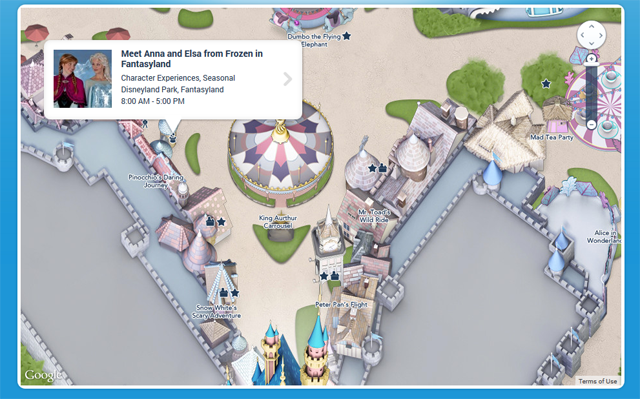 You can find the location of the Meet-and-Greet on the Disneyland map HERE. We actually went by the house the day before to see where the line begins. Be sure to check the opening hours of the park and to find out when the Meet-and-Greet starts. Even though it started shortly after 7am for us, the time may change. You can find out what time the park and the Meet-and-Greet opens on their website HERE. In order to be in the front of the Frozen line, you must first try to be in front of the bag check, and be one of the first to get through the ticket checkpoint. There are A LOT of people heading for the Frozen meet-and-greet and being early at the bag and ticket checkpoints will help to get you ahead in the actual meet-and-greet line. Assign one person in your party to run to stand in line. There is no point in getting the entire party to run to the Frozen line because the little ones will only slow the grownups down. Just send one person to go stand in line while you walk with the kids to the Frozen house. We were lucky that both Elsa and Anna were there at the meet-and-greet because we had read that sometimes only 1 princess is there. Be prepared that you may not see both princesses. We were extremely lucky that we did not have to wait longer than 10 minutes to see Elsa and Anna. Many folks had to stand in line even though they ran just as hard as Hubby. In the event that you do not get to see the princesses, there is another chance. 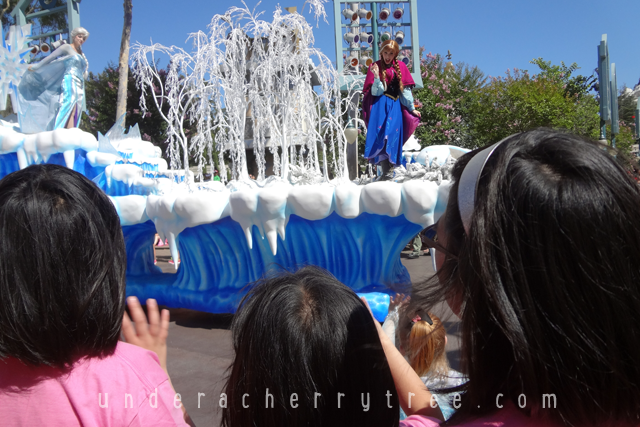 We saw Elsa and Anna on a float about 10-15 minutes before the 4pm Mickey's Soundsational Parade. Check with a Cast Member if the princesses will be appearing in the pre-parade on the day of your visit too. 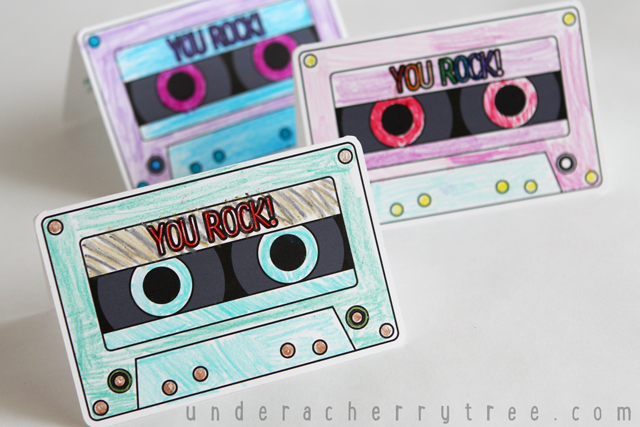 How cute are these cards? I love them! Ivy Toh made these mini notecards after following my tutorial. Thanks for sharing your notecards, Ivy. They are adorable!! 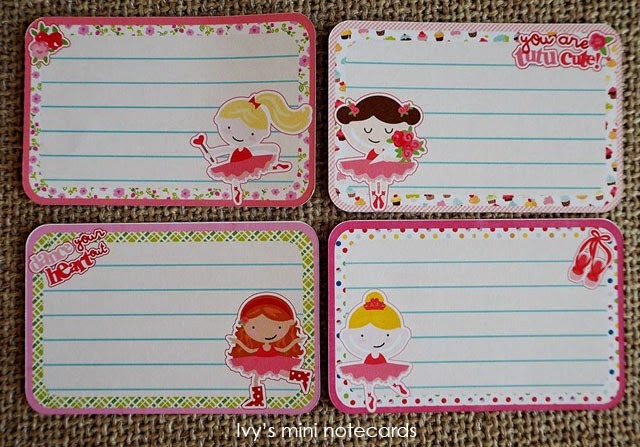 I have the LD Tutu Cute graphics and I am so making these for my girls! This is an awesome deal!! I bought it as soon as I saw Jamie's comment. These are not cutting files but they would be great for print-and-cut. Thank you for sharing, Jamie! 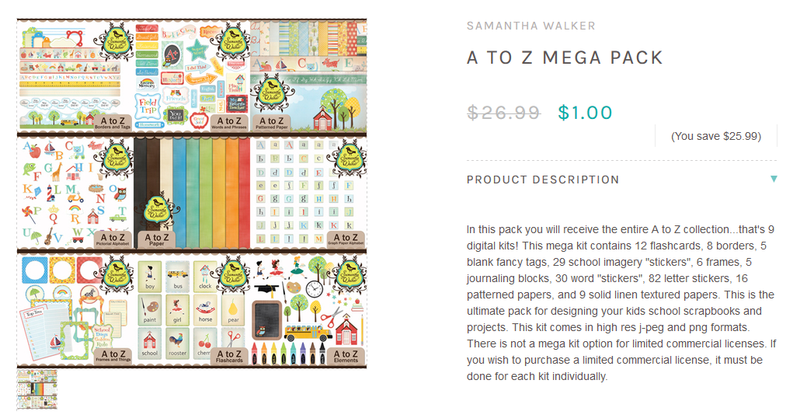 Click HERE to buy the A to Z Mega Pack. Today is the last day of school! 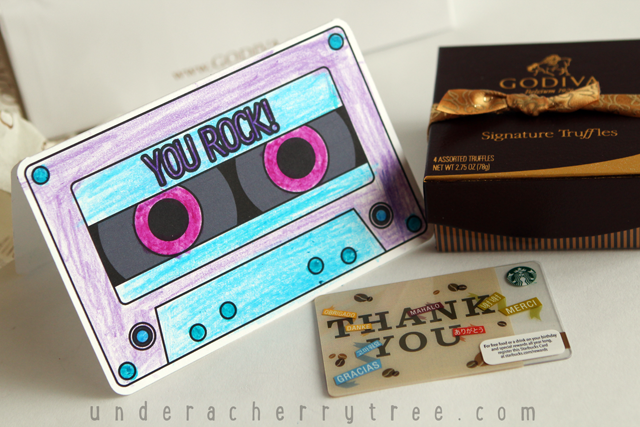 For a quick "Thank You" gift for the teachers, I got chocolates and a coffee giftcard. I also got the kids to write a thank you note on a color-it-yourself card. 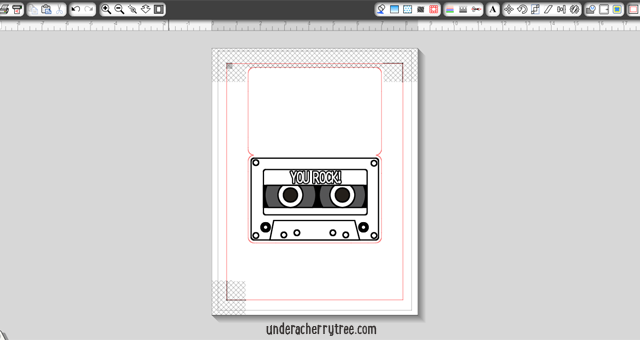 To make the shaped card, I turned the pre-colored cassette tape SVG into a black & white clipart. If you had missed my tutorial on how to do this, just click HERE to find it. 40% off Silhouette Studio Designer Edition!